Switzerland, the home of flashy one-handed backhands (cc: Roger Federer & Stan Wawrinka), snow capped mountains and more recently a new dance connoisseur in Ecar (soundcloud). Wasting little to no time, Ecar has kickstarted his musical journey on his very own label Royalties Rates Records (R R R). We’re constantly putting pen to paper on unique dance cuts from all across Europe but very rarely from this region and boy do these four tunes spell promise for what’s ahead! Not much is known of Ecar at this stage but what we do know is that he is an individualistic artist, a sole trader who has always written music by himself. Some may find this a little introverted but for him it has instilled a real sense of ‘DIY’. Having the ability to apply and deliver your craft without the assistance or meddling of others can be a golden attribute in music. Ecar tells us that the reason for Royalties Rates existence is simply to become another voice in the beautiful conversation that is club music. 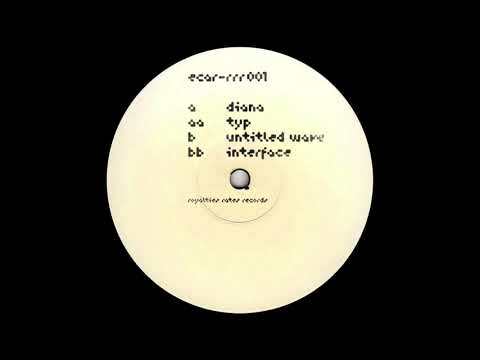 And what a nostalgic dose of club music we receive on the A1 “Diana”. Compressed drum breaks kick hard as we’re quickly introduced to a twanged out synth scale that sounds as though it’s recorded straight from an 80’s house party. Unsuspectingly so, the sweet tones of a Diana Ross vocal from ‘It’s Your Move’ enter the fray, alongside a scuttling drum machine, propelling the tune into a swell of positivity. The two B sides on the record speak more to the modern late night. In particular, on “Untitled Waves”, Ecar shows a deep knowledge of the acid genre, taking listeners on a beautifully eerie journey. Tech stabs roll over ethereal synth patterns as the Suisse fellow takes us somewhere else… It’s like diving head first into a dank rave scene of cinema, you don’t recognize anyone around you yet you’re in rapture regardless. From what we’ve heard on the inaugural release from Royalties Rates Records and its head honcho Ecar, there can only be further class audio to come. Only 300 of these gems will pressed, so don’t sleep and get your pre-orders in. Welcome to R R R!